Small bubble wrap rolls are our most popular range and ideal for the cushion protection of delicate and fragile items while in transit. With a standard 100m roll length, we stock a range of roll heights so suit most applications, from 300mm to 1500mm, with other roll widths available on request. Small bubble wrap rolls are our most popular range and are ideal for the cushion protection of delicate and fragile items while in transit. With a standard 100m roll length, we stock a range of roll heights to suit most applications, from 300mm to 1500mm, with other roll widths available on request. The small does not refer to the roll size, but actually the bubble size, which is 4mm in height and 10mm in diameter. The smaller bubble size allows the cushion film to be wrapped around small intricate items easily. We also stock large bubble wrap rolls which have a bubble size of 7mm in height and 25mm in diameter and standard roll length of 50m. Large bubble is perfect for heavy duty and bulkier items that require additional cushion protection. With over 1500 rolls of bubble wrap in stock, we are one of the largest suppliers of bubble wrap in the UK. 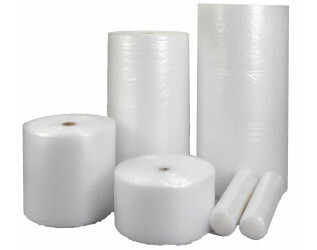 Our comprehensive range includes our own brand ukpackaging.com small and large bubble wrap. This specially manufactured bubble wrap is 100% recyclable and allows our customers to benefit from a high quality cushion protection at an unbeatable price. At ukpackaging.com we have worked hard developing our bubble wrap range to provide customers with a wide choice to suit most applications. Across 14 different ranges we hold over 50 sizes and 6 colours of bubble wrap in stock. From high volume retailers and manufacturers packaging goods for transit, to house movers looking to protect their valuables, our helpful sales team can provide guidance on the most suitable product to meet your requirements and budget.